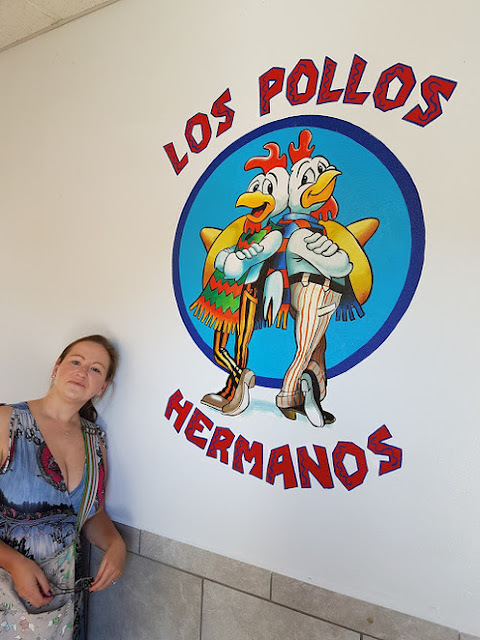 Sightseeingshoes: Los Pollos Hermanos, anyone? 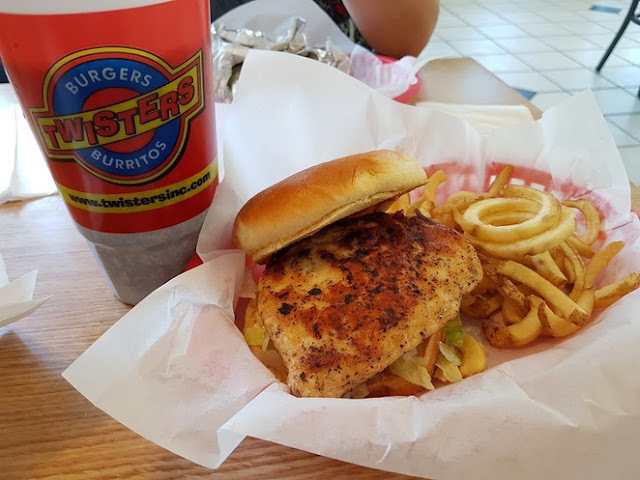 Anyone that's ever tuned in to Breaking Bad on TV will be all too familiar with this iconic eatery, frequented by Walt and Jesse during their dealings with evil meth manufacturer, Gus Frings. 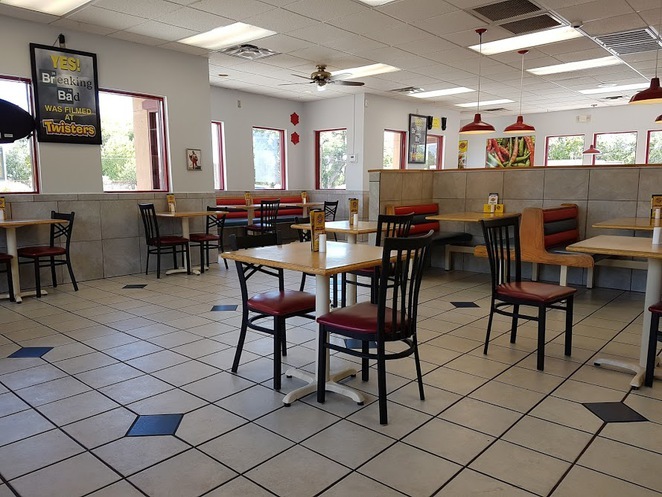 Los Pollos Hermanos (The Chicken Brothers) was a main feature of the show and filming was done on location at Twisters fast food outlet, outside Albuquerque city centre. The brand colours and interior are instantly recognisable to fans of the show and pulling into the parking lot, like you watched Walter do on so many occasions, has a surreal feeling to it. The LPH signage obviously isn't above the doors as it is on the show, and the exterior signage is for Twisters but, the second you walk inside, there's a large LPH poster on entry, so you can have your photos taken while you randomly point at it (like I did...). 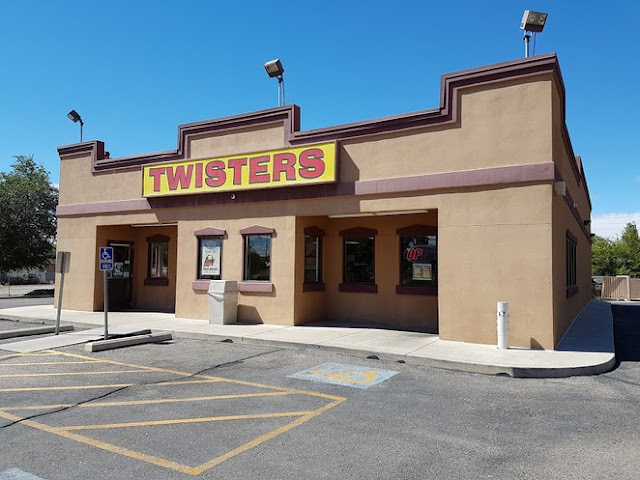 Although the location was a massive part of Breaking Bad, Twisters doesn't make a big deal about it. If it was *my* store, I'd be erecting neon flashing lights outside and dressing up as Heisenberg to get people in. Twisters, however, has the large Los Pollos Hermanos sign on entry and a paper sign above the booth that Walter White sat in. A paper sign, people! Mine would be gold plated, but maybe I like the show a little too much and don't have to deal with Scottish tourists screaming with glee when they come in the door. I imagine that gets real annoying, real quick. Sorry, guys, but it was SO exciting! As well as grinning from ear to eat and pretending we were meth dealers, we also had lunch at Twisters. Obviously, we ordered chicken. 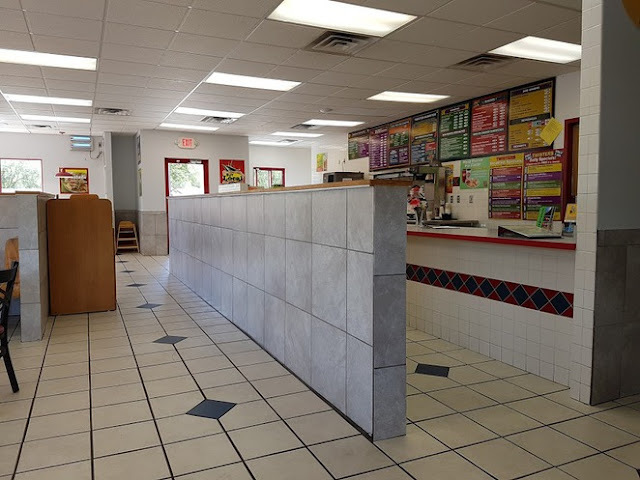 The fare is typical South western fast food and offered a range of burgers, enchiladas and fries. It's like a far more exciting McDonalds. Obviously, I sat in our booth, trying to work out if the Manager of the fast food joint actually *might* have been a secret Meth dealer, but he looked far too friendly and happy for that kind of thing. If you're a fan of Breaking Bad, or just fast food, it's definitely worth a visit. I promise you'll instantly recognise the location the second you pull into the lot and will be desperate to go home and cook crystal meth. I jest, of course - please don't do that. Just eat your food and behave yourself.